Tag line: "He was a powerful warrior from the future, trapped in a prehistoric land, battling for the survival of his people"
It’s easy to scoff at a movie like Antonio Margheriti’s Yor, The Hunter from the Future. Sure, it’s a slice of ‘80s cheese with questionable acting, a silly storyline, and some marginal special effects. But Yor is also never boring, and by the time it wraps up, the film has successfully merged two genres into one, which, along with an unexpected twist or two, earned this fantasy / sci-fi flick a few bonus points in my book. Though a brave and mighty warrior, Yor (Reb Brown) knows very little about his past, and even less about the bright gold medallion he’s been wearing around his neck since childhood. As he makes his way across the sometimes treacherous landscape of his prehistoric world, he encounters a number of different people, many of whom require his assistance. Chief among them are the beautiful Ka-Laa (Corrine Cléry) and her guardian Pag (Luciano Pigozzi), who Yor rescues from the clutches of a dangerous dinosaur (well, it looked like a Triceratops to me, anyway), and when their tribe is decimated by some evil cave warriors, Ka-Laa and Pag join Yor on his continuing search for his identity. A chance meeting with Rea (Ayshe Gul), the leader of the Sand People; and a later encounter with a tribe of peaceful beach dwellers, provides Yor with additional clues about his heritage. But when he and his companions set out for the elusive island that might be his home, our hero finds himself facing off against the Overlord (John Steiner), a being more powerful than any he has ever encountered before. Based on the Argentinian comic Yor the Hunter, Yor, the Hunter from the Future originally aired as a four-part, 200-minute miniseries on Italian television before being pared down to just over 90 minutes for this theatrical release. With more than half its running time excised, you’d think Yor, The Hunter from the Future wouldn’t make a whole lot of sense, and at times it doesn’t (we learn very little about the various tribes that Yor and his friends encounter, and have no sense of how big or small this world is). What remains, however, is chock full of action and excitement, and with a plot this simple (a man searching for his past), the story is never hard to follow. Yes, the special effects are on the cheap side (though the one or two dinosaurs our hero encounters look better than expected), and some scenes are completely ridiculous (to save Ka-Laa, who’s been captured by the Cave People, Yor kills a winged "creature of the night", aka a giant bat, then uses its dead carcass like a hang glider, floating down a sheer cliff and straight into the cave of his enemies). But in its final act, Yor, The Hunter from the Future makes a nice transition from a sword-and-sandal style fantasy to a futuristic science fiction adventure, a change that begins with an attack that took me completely by surprise (not so much the attack itself as the weapons that are used). 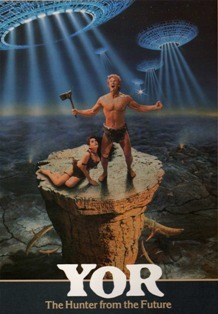 So, while Yor, The Hunter from the Future is, in many ways, the kind of movie you and a group of your friends would enjoy picking apart (a la Mystery Science Theater 3000), it’s far from the worst action / fantasy film ever made, and has just enough ‘80s cheese to occasionally bring a well-earned smile to your face. This looks like something right up my alley!! You find the craziest flicks keep up the good work! Bob: Yeah, it's cheesy fun. And thank you so much! I'm glad you're finding some new titles to check out.